The last few days have been spent in gathering things together and I could feel my excitement build up, with butterflies in the stomach, to the adrenalin surge thinking of the adventure on that white blanket up north in India called Chadar !! 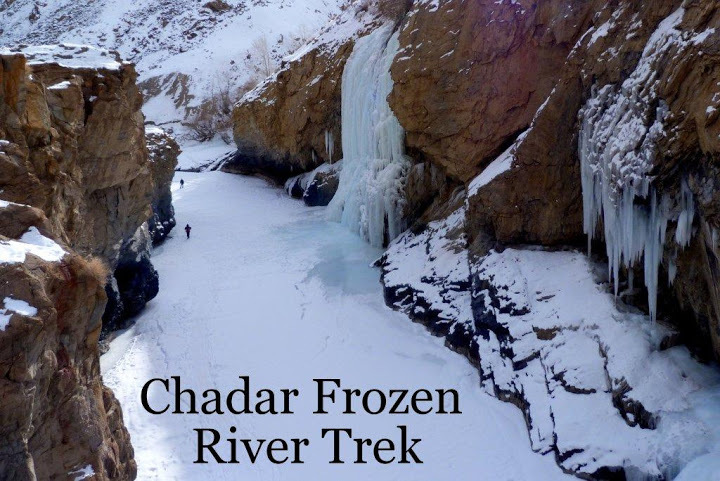 I am heading out next week to the Frozen River Valley Trek in the Ladakh area. After months of physical and mental preparation to endure -25 degrees for 10 days, I am counting days to the start. When I first saw the pictures, I wanted to just be there, to experience the beauty of the frozen Zanskar, to interact with the people who lived there enduring all extremities. Pictures of some places or merely thinking of them, take me beyond, eyes well up for no explainable reason, the heart overflows and there is a buzz in the ear to take the plunge to experience. That is what I experienced at the thought of Chadar. I am trekking with India Hikes along with 20 odd people from different parts of India all with the single goal of experiencing that white blanket on a moonlight night which they say is as close as you can get to heaven!! Will I cringe in the cold, or brave it out to sing a lullaby to the moon – time will tell. I am eagerly waiting to share my experience with you, meanwhile wish me luck for this trip of a lifetime. All the best, have a great trek!!! I have heard so too…which attracted me to take the trip. Have a memorable and safe trek! I need all the wishes, Thank You. Sure Sindhu. I hope my fingers move in the cold to take those pics. Sounds like an exciting adventure! Have a great trip! wow – I saw a series of documentaries on this trek!! I hope you will enjoy it – I am jealous, but I would need some training to do it, I guess!!! Good luck – you are clearly more hardy than me! Look forward to the photos. Dear Oyia, Thank You for all the reblogs and the wishes. Will upload pics as soon as I am back. Wishing you the best on your adventure. Can’t wait to see and hear about it. Thank You so much. I really need it.